Brian had the ultimate show-and-tell story. A classmate of mine in elementary school, Brian only had to push back his sleeve to make others in the class gasp – some in awe, some in terror. On his upper arms were dark marks that looked like liquid stains, which was exactly what they were. Brian had these scars for years, he told us – a relative was holding him when he was a baby, and spilled hot coffee all over him. It had been years since I’d thought about Brian and his burn scars, but the memory rushed back soon after my son was born this year. Just as in my school years, I kept imagining a baby smiling one moment, then wailing from the shock and pain of hot coffee spilling on him. It was an inversion of parental horror stories designed to scare kids straight – here was something a child once told me that was now haunting me as an adult. As a heavy coffee drinker – at least three giant mugs a day are the norm – I now realized that I had to be extraordinarily careful about drinking coffee with a baby in the house. And thus a Parent’s Paradox: With the reduced sleep brought on by a new baby, I needed caffeine at a crisis-level not experienced since my college years, but the window of opportunity to drink coffee grew smaller and smaller as the baby grew more mobile. There’s a subgenre of baby-proofing that applies to parents who drink coffee or tea. According to the American Academy of Pediatrics, unintentional home injuries are the leading cause of death in infants 1 year old or younger, and fires/burns are one of the four top causes of home injuries in children. AAP Safety sheets for parents of babies age birth to 6 months and 1-2 years describe potential hazards hot beverages can pose for children, along with some tips on reducing the risk of burn. The coffee mug used in this photo was empty. Perhaps the granddaddy among rules for parents regarding children and coffee is to NEVER carry a child and any hot food or beverage at the same time. This sounds obvious in theory, but people still do it. “I’m amazed at how many ER burns I see where it turns out a parent was juggling an infant and a cup of coffee at the same time,” said Karen Sheehan, M.D., of Children’s Memorial Hospital in Chicago, in an article by Hallie Levine Sklar of Parenting.com on at-home baby safety hazards. As babies become more mobile, coffee-drinking parents need to become even more cautious. Think Murphy’s Law from both the baby’s perspective and the coffee mug’s perspective. 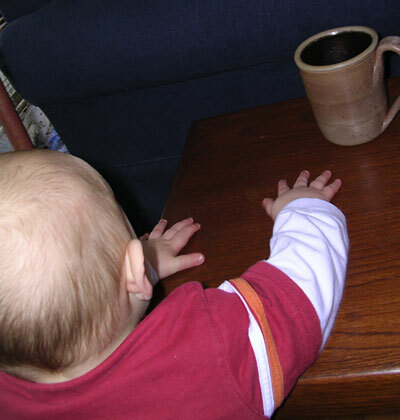 Is the coffee within reach of a crawling or standing baby? If the coffee is on a table, what if it spills? Is the baby within the spill range if this happens? Is there a tablecloth or is the coffee set on something else the baby could reach? Several other sites, including ones for the Clark Burn Center at SUNY Upstate Medical University and KidsHealth.org describe potential hazards coffee can pose for a child, and have related safety tips. It wasn’t long before I realized that my morning coffee routine would be washed away in the sea change my baby’s arrival demanded. A leisurely half-hour gradually downing a giant mug of drip-pot coffee wasn’t going to happen any more. There was a baby who required breakfast, morning stories, and periodic rescues as he crawled toward “danger spots” in the house. Carpe Sipum (‘Seize the Sip’) – Brew the usual morning coffee, pour a mug, put it in a secure spot that’s out of harm’s way, and steal sips whenever you can. Baby’s breakfast is a golden opportunity – he or she is secure in a high chair, while the parent can set the mug on a nearby counter (way out of baby’s reach, please), and take sips between serving up spoonfuls of organic pureed bananas. Pros: This option involves the least “rocking the boat” with coffee preferences. You brew up the same amount of coffee, the same type of coffee. Nothing changes except for the rate of consumption. Drink from a travel mug – It’s not just for the car any more. Pros: Reduced chances of tragic spills, yet the coffee stays hot longer. As with the above method, you can continue brewing your favorite type of coffee and enjoy it hot. Cons: A good travel mug reduces the likelihood of a spill, but doesn’t eliminate the possibility – the lids on many travel mugs may pop off if the mug falls. Condense – For those accustomed to a drip-pot, maybe this is the time to switch to espresso. A small cup of espresso can be finished much more quickly than a large mug of coffee, and it cools more quickly than a large mug of coffee. Pros: There’s no sacrifice in quality – most premium coffee drinks are made with espresso. All the caffeine is packed into a tiny cup, and there’s less potential spillage. Cons: Brewing espresso requires different equipment from a conventional coffee maker. Most espresso machines cost in the hundreds-of-dollars range, although there is a stovetop device for making espresso, the Moka. The intensity of espresso isn’t for everyone, but for those who need their caffeine badly enough to ponder the options in this article, it’s worth a try. Iced coffee – Like several of my INeedCoffee colleagues, I will not reheat coffee. If I ever brew more than I can drink, I’ll put the unfinished coffee in a Tupperware container and put it in the refrigerator – there’s always a steady supply of iced coffee available in my fridge. Pros: Come morning, this is a low-maintenance way to get one’s caffeine-buzz on. There’s no need for anybody to sacrifice their favorite bean this way, and some coffees taste surprisingly good when they’re cold. Cons: It won’t feel right to many parents. After years of drinking a hot caffeinated beverage each morning, the drink’s temperature alone may have a placebo effect; iced coffee may not cut it as a “wake-up” drink. Take Back the Morning – Parents can take their coffee as they please for awhile if they wake up earlier than their baby. This assumes, of course, that there’s any predictable pattern to the baby’s wake-up time, and that is not always the case. Pros: It’s rewarding to have some early-morning time that’s exclusively your own. Barring an early awakening from the wee one, you can drink hot coffee at your own pace, and be good and caffeinated by the time the baby wakes up. Cons: Like a New Year’s resolution this is much easier said than done. It may well require an earlier bedtime the night before, and now we’re talking about some serious time-management issues. Find a drive-thru Starbucks. When things are at their craziest, strap the kid into the car seat, drive through, and have a peaceful cup of coffee. The perfect location is about 15 minutes away, so that you have a nice amount of driving time to drink your steaming hot drink. I would do this at one of two times: when my baby needed to sleep but wouldn’t; she would often fall asleep somewhere during the trip. I also do it now when my daughter is crabby (or I am); she gets a change of scenery and a book in her carseat, kid’s music on the radio, and sometimes a Horizon Organic Vanilla milk (another big bonus of Starbucks–so much better than a cookie, but the kiddies love it. It tastes like a milkshake). The art of parenting is always a work in progress. I’ve tried some of the above alternatives, and merely thought about a couple of the others. So far, what was once a coffee routine has been replaced by an ongoing coffee experiment. I feel certain that there are some other options that haven’t crossed my mind, and I’m interested in hearing from any other parents who may have some tips on this subject – this is certainly not an exhaustive list. E-mail any tips to [email protected] – we’ll post suggestions in a forthcoming article or a revised version of this one.